Love Vietnames food? Head to Spiral for the fresh, clean flavors of authentic Vietnamese fare. 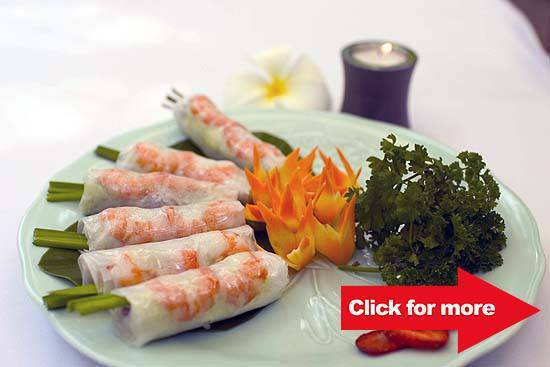 Vietnamese Transparent Summer rolls (Goi Cuon). Click for more photos. A Vietnamese station will be added to Spiral’s buffet spread for Essences of Vietnam: A Food Festival, which started last August 25 and will run until September 5. 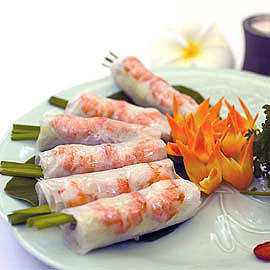 Enjoy dishes such as fresh spring rolls, deep-fried crispy battered soft shell crabs and steamed fresh prawns in coconut juice, prepared by master chefs Somnuck Attawon, Executive Chef of Cham Charm Restaurant in Vietnam and Le Quang Danh, Executive Chef of Nam Phan Restaurant in Vietnam. Authentic Vietnamese cuisine is marked by the use of fresh vegetables and fish sauce, says Chef Attawon and the spread at Spiral will represent all regions of Vietnam: from the city of Hanoi in the north, to Hue in Central Vietnam, to Ho Chi Minh in the South. Other dishes on the spread include Sup so diep tom tuoi (scallop and prawn soup), Ga nuong la chanh (roasted chicken with lemon leaf), and Su’on non nu’ong xa (pork spare ribs with lemongrass). Dessert specialties such as Che khoai mon (taro sweet soup) and Che chuoi (banana sweet soup) and Vietnamese beverages such as Vietnamese iced tea and Vietnamese rice wine will also be available. Guests may enjoy the Essences of Vietnam food festival along with the rest of Spiral’s 350-dish offerings until September 5 for lunch and dinner, including a new Thai kitchen and foie gras station. Rates start from P1,488++ per person.